The Kremlin has denied that it is wavering in its support for Venezuelan President Nicolas Maduro following media reports that Russia is beginning to doubt the leader’s ability to survive an opposition challenge. 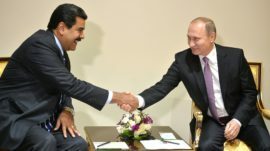 “The Kremlin’s position hasn’t changed at all,” the RBC news website quoted presidential spokesman Dmitry Peskov as telling reporters on Thursday, indicating that Moscow continues its support for Maduro. Russia and the United States do not maintain contacts on Venezuela, Peskov added.